Revenant bitten, always smitten. 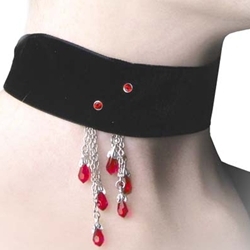 A soft band of velvet will caress your throat when you wear the elegant Bitten Choker Necklace. This vampire necklace displays an artistic depiction of the victim of a creature of the night. The Death of a Vampire Pendant represents the blackest night of a member of the blood-thirsty undead. This vampire pendant showcases a garnet Swarovski crystal heart, staked and eternally consigned to ashes and oblivion. The Bleeding Heart Necklace features a cascadA cascade of crystal blood droplets pours from the cruel wounds of this tortured love. The Bleeding Heart Pendant displays a battered and bloody heart set among several skulls and ornate scrollwork details.